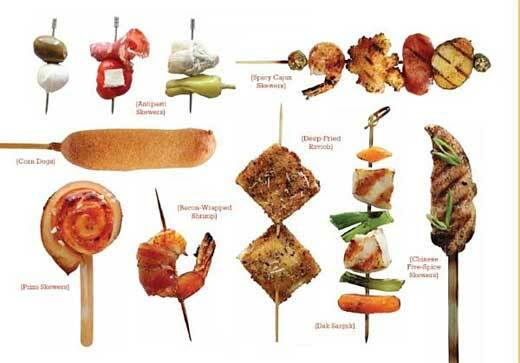 Why do the world’s most delicious foods taste even better served on a stick? Eighty quick-and-easy recipes for foods on sticks and skewers - from elegant hors d'oeuvres like caprese sticks and chocolate-covered cheesecake to delightfully lowbrow treats like corn dogs, fried pickles, and fudge puppies. Plus tricks for using sticks and skewers like cocktail picks, sugarcane and fresh rosemary. Ideas for entertaining and quick and easy recipes for delicious homemade marinades, dips, and sauces. See for yourself why everything tastes better On a Stick! Matt Armendariz is a man who loves food, drink, and everything in between! As a former art and creative director for such companies as Whole Foods Market and Bristol Farms, Matt has been immersed in the world of food for 20 years. In 2005 he started Matt Bites, a food blog recognized as one of the world's 50 best food blogs by London Times Online. TThis book is perfect for parents trying to get picky kids to try new things. I have four boys who all have very different food quirks. This book is a great way to get them involved in trying new things. What kid doesn't want to eat something on a stick? It's fun, tasty, and they can stand right next to you and make their own. When I found out about this book, I knew I had to have it. The title alone got me intrigued. 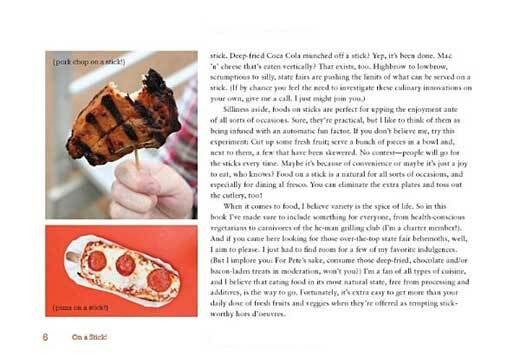 I thought the idea of a book where every single recipe is on a stick was the coolest and most original ever.I was impressed by the creativity and playfulness of the recipes: pizza on a stick, strawberry shortcake on a stick, even spaghetti and meatballs on a stick!! I have tried the sweet potato wedges and they were very tasty. I can't wait to try more recipes. As soon as I heard about On a Stick! I knew I had to get my hands on it. Matt's fun, high energy personality shines through on every page. The recipes are amazing, well thought out and each one is a "must try!" I love the diversity of ingredients and the range of flavor combinations. They are easily adaptable for different food preferences and lifestyle choices. 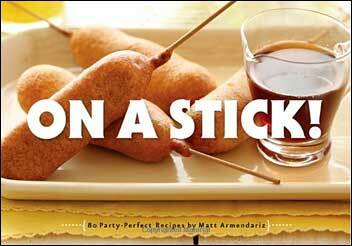 On a Stick recipes would add a playful, memorable twist to any party. From beach potlucks to fancy get togethers - serving these skewered foods to guests would be impressive. They are simple to prepare, and a clever way to stand, mingle and enjoy food with friends. 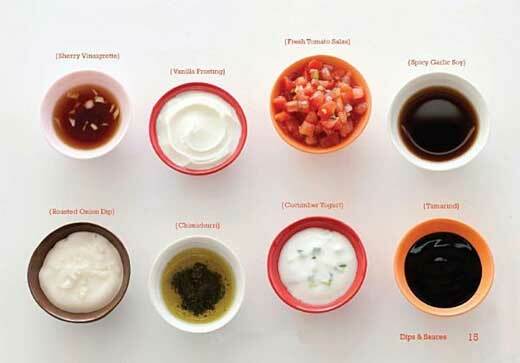 All the bases are covered too, savory, sweet and dipping sauces. Add in some fun cocktails and the party is well on it's way. Totally fun to read, I love how it's written in the first person, I found myself reading it like a regular book instead of looking at the recipes. Then I get sidetracked by the amazing looking food . . . want now! Which one should I try first? I know my daughter would go for the deep fried Mac n cheese, and the Spaghetti and Meatballs on a stick look crazy good, but the Korean-style BBQ pork belly skewers and ground shrimp on sugarcane have me drooling. I think I can pull a few of these recipes as most of them have less that 6 steps. Can't wait to try them. Bite-size pieces of tender chicken and leeks are skewered and sprinkled with sesame seeds to create this Japanese classic..
Soak skewers in water about 30 minutes. Place soy sauce, sugar, sesame oil, mirin, and sake in a small saucepan and simmer over low heat until sugar dissolves, 2 to 4 minutes. Remove from heat, stir, and let cool. Pour mixture over chicken and fold together. Cover, refrigerate, and marinate 30 minutes. Preheat grill or grill pan to high and brush with vegetable oil. Thread chicken and leeks onto skewers, alternating items. Grill 5 to 6 minutes per side. Sprinkle with sesame seeds and serve warm. I'm still surprised when I hear friends say they're not keen on lamb. I think it's probably because they've never prepared it themselves. To change their minds, I feed them these flavorful, herbal kebabs paired with a side of minty chutney. This dish is definitely a favorite at my house. Make the chutney: Place mint, cilantro, onion, yogurt, and lemon juice in a food processor with 2 tablespoons water and process until almost smooth. Season with salt and pepper to taste. Transfer to a bowl and set aside. Preheat grill or grill pan to medium-high and brush with vegetable oil. Whisk olive oil, tarragon, thyme, rosemary, garlic and cumin in a large bowl. Add lamb and toss until well coated. 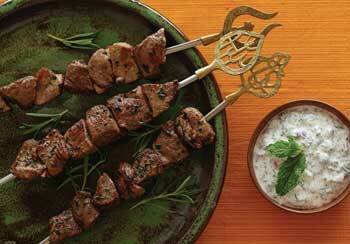 Thread lamb onto skewers and season with salt and pepper to taste. Grill 5 to 6 minutes on each side. To skewer lamb cubes on rosemary branches, poke them first with a metal skewer. Quick: Name one ingredient that's better than bacon. See? You can't. And part of its beauty is that so many things - including these shrimp - are made infinitely more delicious when wrapped in this salty, smoky stuff. These morsels move fast at parties, so prepare an extra batch. It pays to use the highest quality bacon you can buy. Soak cocktail picks in water 30 minutes. Line a baking sheet with aluminium foil and coat lightly with non-stick oil spray; set aside. Place shrimp, lime zest and juice, chili powder, salt, pepper and oil in a bowl and toss gently. Cover and refrigerate at least 15 minutes and up to 1 hour. Remove cocktail picks from water. 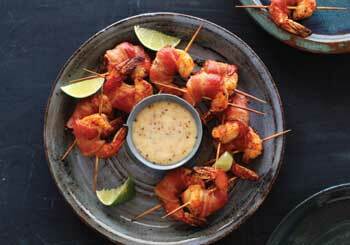 Wrap each shrimp with half a slice of bacon and secure with a cocktail pick. 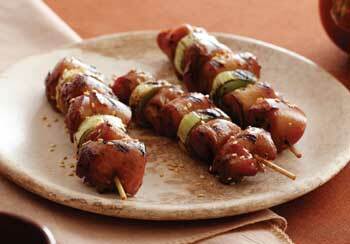 Place skewers on prepared baking sheet and bake 20 minutes, turning skewers after 10 minutes. Whisk all ingredients in a small mixing bowl until blended. Before serving, let sauce rest at room temperature for 20 minutes to allow flavors to meld.